I’ve found that in difficult times, whether personal or global, I tend to always retreat into art. And you. fellow artists, creative people, wildly imaginative, pink-hearted friends, I bet you retreat in your own way. Do your own thing to stay calm. It’s so important to stay calm, isn’t it? This is an old copy of a map of war. The war was the Battle of Gravelotte. 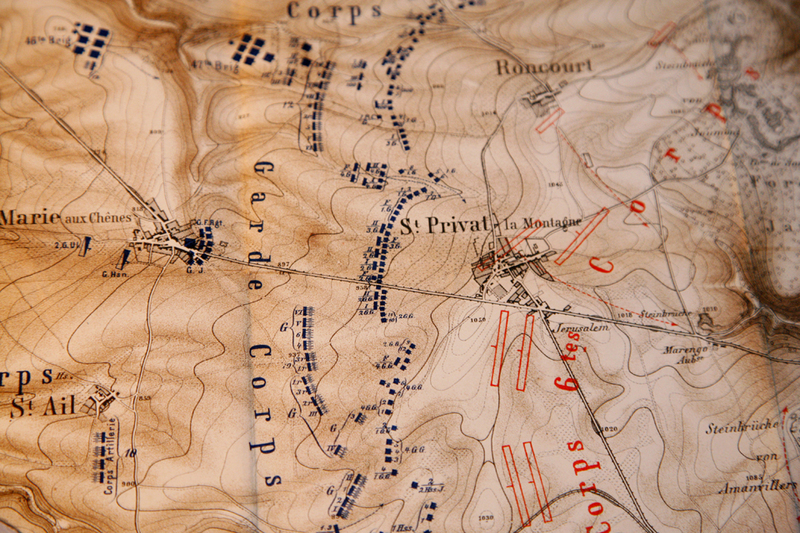 It shows the troop placements along the French German frontier in 1870. Representing the community of people is this common pigeon. There are millions of them in every city, every town, every village all over the world. All ready to stand their ground, fly together in unison. Representing calm is this dove. Just another in the community of pigeons, but she is turned in a different direction. And look, she has got the attention of the pigeon. “Be Calm”, she says. Follow me to a calmer, happier place. Time was a bit limited this week, and I didn’t quite finish this piece. (which is why the birds are floating instead of being grounded…lol) Time! Everything needs time. 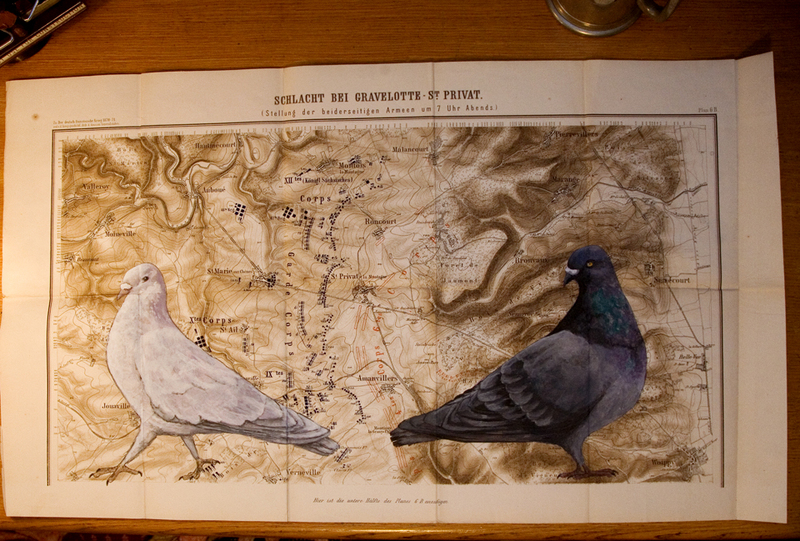 Art: 25yr old reprint of a map dated 1870, inks, watercolours, graphite, watercolour pencils. Last post from home, next post from … home! Wow, that’s beautiful! You’re a great artist. funny that you should say that, veronica, about turning to art in times of trouble. i can quite relate, but always in an unexpected way too. i may have a completely other onset, yet i’ll end up creating sómething. yes, art is a form of expression of the soul, of what we feel, of what we fear. that too. … i’m sure you’re right in stating that the process brings calm. it’s such a good topic you chose. 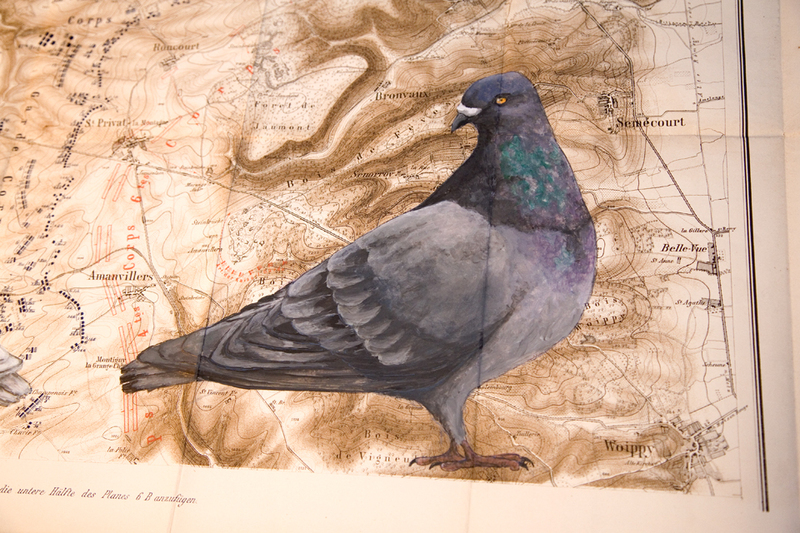 i never noticed your birds are floating, i rather assumed they held onto the map’s border… what a beautiful expression you give us, the story to go with it so rich and compassionate. you’ve made a very meaningful composition on the old map too. such trains of thought you ride, amazing. thxs for the linky link up, it works, don’t it? another good idea! have a wonderful weekend. for once, omg-how-did-that-happen? my DC is up already. it was, rather unexpectedly a good week of calm, determined resolve for me. may the weekend commence, after saturday morning classes…. I love this Veronica! I love the map, the birds and the story. Wonderful! I love the dove but don’t get me started on pigeons. I have a hate-on for them right now. They have been pooping on my balcony. All of the work posted here is so beautiful. Thank you for creating this challenge just when we needed it. using doves and pigeon for calm. lovely. I like the linky, so nice to know when to visit one another. I love the symbolism and the idea of trying to calm down the intention of the map! Thanks for the challenge! It was a motivational challenge. It reminded me that I miss blogging and writing and reflecting with like minded people! Thanks, Veronica, for the nudge! Dear Veronica, what a wonderful work! 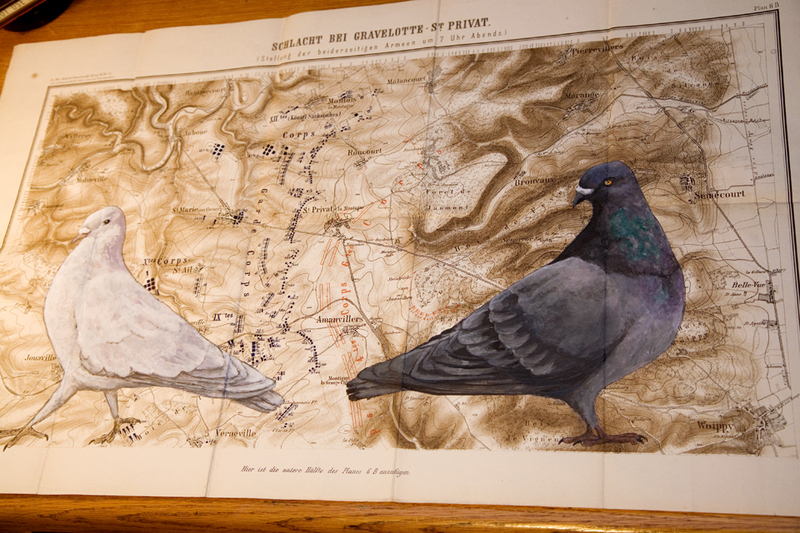 It really touches me, these two pigeons in white and black, the map of war, full of symbolism, in my opinion it´s just brilliant. Doing art always calms me down. As you say. How beautiful, this representation of our duality. May peace prevail in the world, and calmness of spirit. Dove of peace, dear Veronica, beautiful! Crossing borders in a free and friendly way. Here dove and pigeon a different, but same. 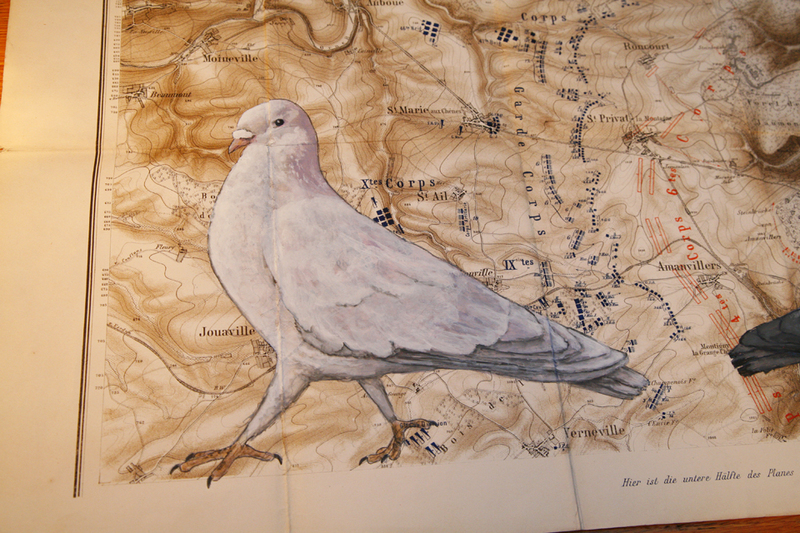 To paint these birds, having wings like angels, on a map of troops in the French-German war 1870 is metaphorical, very well chosen! And as a painting, Dear, wow!!! Chapeau! I want badly to paint on some old papers. Problem is I’m not much of a painter. But I intend to try it digitally. This is fabulous. Lovely. The art. The symbolism. The message. Lovely. we realized it already that we are both bird lovers and yours is such a wonderful piece of art, the pigeons look such fabulous and it is always a bit strange to find written in german a foreign place. Very very nice. Beautiful work dear Veronica! Love the old map and the message! Wishing you a calm weekend! what symbol would be better than a pidgeon. Looks like they have a discussion about something, but the white one is the convincing one. Great drawing on the map and yes you are definitely right, we should stay calm.